Yum – this was a perfect accompaniment to our salmon dinner tonight. I like the fact that I don’t have to babysit this at the stove trying to split time up between it and the main course. It baked away in the oven while I prepped the salmon and broccoli; but this rice takes over an hour to bake. I needed to start this about 40 minutes before I could cook the broccoli and salmon, but it worked out well because once the rice was about 20 minutes to completion, I placed the salmon on the bottom rack of the oven. The flavor was garlicky and nutty with a hint of the lemon. I added shallot to this and lemon zest to up the flavor and added about a half tablespoon more butter. This will definitely be in our rotation! Thanks for reading, enjoy! Preheat the oven to 375° F. Have ready a covered casserole dish (*I don’t own a covered dish that was small enough, but foil worked just fine*). In a saucepan or skillet, melt 2 tablespoons butter over medium-high heat. 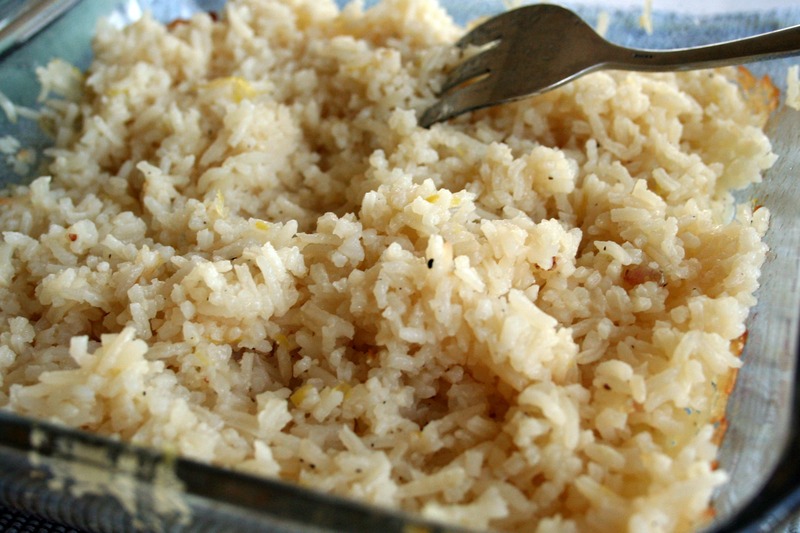 Add the garlic, shallot and rice to the pan and cook until both are golden brown, about 3-4 minutes. Stir in 1 cup of the chicken broth, salt and pepper and bring to a boil. Pour the mixture into the casserole dish, cover, and bake for 25 minutes. Stir in the remaining 1½ cups chicken broth, lemon zest and 1/2 tablespoon of butter and bake, covered, for another 45 minutes. About 15 minutes before it is finished baking, stir in a squeeze of fresh lemon juice. Note: This recipe can be doubled without increasing the baking time.